One thing has not changed: nationalism in all its forms remains the working class’ mortal enemy. 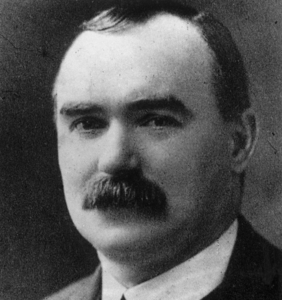 The positions set forward in this article thus remain essentially valid: and, one hundred years after the Dublin Easter Rising, it still stands as an answer to all those who would hijack the memory of James Connolly, an Irish revolutionary socialist shot down by the British army, for the cause of Irish nationalism. “The Labour movement is like no other movement. Its strength lies in being like no other movement. It is never so strong as when it stands alone” (James Connolly from “What is Our Programme”, published in the Workers' Republic, 22 January 1916). Ever since the outbreak of World War I, desperate factions of the bourgeoisie, determined to survive, have resorted to marxist phraseology and claimed a continuity with the workers' movement in order to save their own skins. In Ireland, the Republicans and their leftist followers have laid their hands on James Connolly in order to justify their dirty work. In equating “Lenin and 1917” with “Connolly and 1916”, they try to sell their nationalist garbage to the workers. The bourgeoisie has been telling us what has been happening in Northern Ireland since 1969.2 On the one hand we have been told about the brave and disinterested attempts of the democratic British state to keep the Irish from tearing each other to pieces. On the other hand we have heard much about the struggle of the Irish nation for freedom and independence. In 1969, the leftists declared that in Ulster, the oppression of the Catholics (who in every other country in Western Europe, including Britain, are free men, unless they happen to be wage slaves) was the very basis of capitalism and imperialism in Ireland. And they declared that the workers of Ireland, both Catholic and Protestant, should support the IRA in the fight for national independence, because until such time as this all-Ireland State of Republican and Stalinist butchers has been established, the Irish working class remains too sectarian, too bigoted and ignorant to fight for its own class interests. Today, evidently, the patriots of the IRA are in retreat and disarray, hammered to the ground by the British Army. Ten years of bombings, mutilated corpses found in back alleys, a decade of massacre in which the British and Irish states, the Republican and the Protestant Extremists have all taken part, appears to be coming to an end. But we have seen that under decadent capitalism there is no peace, only the reorganization and reorientation of the slaughter. The workers of Belfast and Derry have certainly had enough of the politicians of Left and Right, of Orange and Green, who wipe the red blood of the workers from their hands in order to respectfully commemorate the dead. The conflict of factions of the bourgeoisie, their struggle for survival in a capitalist system locked in permanent crisis, leads inevitably, as it has in Ulster, to a terrorisation of the working class. We condemn all of these factions of the bourgeoisie, not simply as brutes and maniacs (of which there is of course no shortage), but as our class enemies. When we consider the question of nationalism in relation to the workers’ movement of the last century, we do so in order to show the absolutely anti-proletarian nature of the PLO, Polisario, the IRA and all the imperialist gangs of today. Marx was analysing capitalism in its period of emergence and development, when the bourgeoisie was declaring war on reactionary modes of production. For the advanced workers' movement of his time, it was clear that nationalism – wars of unification to create nation states – was the economic and political means by which the bourgeoisie could crush feudalism and create an industrial society, an industrial proletariat. The creation of nation states meant the securing of particular areas of the globe for the development of capitalism. Communists at that time supported nationalist revolutions directed against feudalism, not out of patriotic feelings – on the contrary, the Communist Manifesto already announces that the workers have no fatherland – but because feudalism as such represented a threat to the development, indeed to the very existence not only of the bourgeoisie but of the proletariat as well. Therefore, support for national struggles is dependent upon the conviction that capitalism remains a progressively expanding system. In the last century the progressive role of capitalism remained obvious and indisputable. Today, however, only capitalism's biggest supporters can find anything progressive about it. “...the thoughtful Irish patriot will throw rant aside and freely recognise that it is impossible for Ireland to do what other countries cannot do, with their greater advantages, viz. to attain prosperity by establishing a manufacturing system in a world-market already glutted with every conceivable kind of commodity. It is well also to remember that even under the most favourable circumstances, even if by some miracle, we were able to cover the green fields of Erin with huge ugly factories, with chimneys belching forth volumes of smoke and coating the island with a sooty desolation, even then we would quickly find that under the conditions born of the capitalist system our one hope of keeping our feet as a manufacturing nation would depend upon our ability to work longer and harder for a lower wage than the other nations of Europe, in order that our middle class may have the opportunity of selling their goods at a lower price than their competitors” (Erin's Hope, 1897). But how did it come about that this marxist who denounced his own bourgeoisie so clearly, and who denounced the entry of the Socialist Deputy Millerand into the French Cabinet as a compromise of the 2nd International with the class enemy, continued to put forward the struggle for national independence in Ireland as a struggle to be supported by the proletariat? Historically we can situate the growth of confusion on the national question within the context of the period of reformist activity leading up to the imperialist war of 1914-18. This was a period when the permanent organs of the working class were tending more and more to find a place for themselves within capitalist society. Connolly's schema of an Irish Republic as a stage along the road to socialism is absolutely typical of the epoch in which he was writing. In Labour in Irish History, Connolly describes capitalism as being something alien to Ireland, whereas capitalism is no more “alien” in Ireland than in the USA. Connolly had always insisted upon the necessity for the proletariat to defend its class autonomy against the bourgeoisie. But the basis of organisational and 'military' independence is political autonomy – class consciousness. Because revolutionaries in Ireland were unable to break with nationalism after 1914, when capitalism's progressive role had clearly come to an end, they were unable to firmly defend the class autonomy of the proletariat. These hopes for a continental revolt were not fulfilled in Connolly's lifetime. In face of a total mobilisation of the European proletariat, and the apparent lack of any possibility of a class solution to the crisis, Connolly began to abandon any class perspective. Because Ireland was under the control of the British state, opposition to that state was indeed the first duty of any revolutionary in Ireland. But only the proletariat can stop the war, just as only the proletariat can smash the system which produces such barbarism. The path which Connolly took after 1914, which led him to the barricades in the company of the petty bourgeois nationalists, was a total abandonment of what he had previously fought for. On 8th August he pointed out the conflict of interests between the workers on the one hand, and the bourgeoisie and the farmers within Ireland on the other; and he called for armed struggle in the streets, in order to “set the torch to a European conflagration”. Nonetheless, the increasing importance of the nationalist perspective leads him to write: “Should a German army land in Ireland tomorrow we should be perfectly justified in joining it if by so doing we could rid this country once and for all from its connection with the Brigand Empire that drags us unwillingly into this war” (“Our Duty in This Crisis”, 8th August 1914). The position which he develops, that the British Empire alone is responsible for the war – for a "war upon the German nation" opens the way for a military alliance with other imperialist powers. This reaches an absolute zenith of confusion in the spring of 1916, where he holds up the patriots of Belgium (who were after all the cannon fodder of Belgian and British imperialism) as models to be emulated in Ireland. Because the workers were evidently not prepared to fight for the Irish Nation in 1916 the way they had fought for their own class interests in 1913, Connolly, in turning his back on the proletarian solution, was forced to join forces with such people as Pearse, despite his profound mistrust of them. Even while workers in Dublin were striking, Connolly and his Citizens Army of the 1913 lockout,5 were negotiating for a putsch with the nationalists, to be armed by German imperialism and which would declare the erection of precisely the kind of parliamentary-democratic state as would soon be used to crush the German workers. For the Easter Rising, the Citizens Army was dissolved into the Volunteers of the nationalists. All pretence of class autonomy had to disappear. The Easter Rising of 1916, staged in the middle of the war (“England's difficulty is Ireland's opportunity”) was quickly and savagely crushed by the British Army. The promised German aid, insufficient in any case, never got through. Just as to this day the IRA lacks a serious backer. The workers' movement in Ireland collapsed after 1916; its traditions obliterated in a half century of nationalist and sectarian counter-revolution. 1916 paved the way for the War of Independence which was the last hopeless attempt of the Irish bourgeoisie to assert a measure of independence. And when, in response to the world-wide proletarian upsurge which followed the war, the Irish workers began to struggle on their own class terrain, the bourgeoisie of Belfast and Dublin turned their weapons against them. In Belfast, the class solidarity of the workers, Catholic and Protestant, culminating in the strikes of 1919, was repeatedly sabotaged by Loyalists and Nationalists. In Limerick the patriotic unions, forced to call a general strike, kept it with the help of the IRA and the local bourgeoisie in Limerick within the bounds of an "anti-British" movement, before abruptly breaking it off, after the intercession of the local bishop. In early 1922 the Republican government in Dublin smashed the strike and occupation movements of the railway workers in Cork, and the mill and creamery workers in Mallow. The workers were turned out by the local IRA commandant on the orders of the cavalier guerrilla, Michael Collins, and by the Irish Transport and General Workers' Union, the proud “followers” of Larkin and Connolly. In addition, IRA troubleshooters were moved in to prevent the outbreak of “disorder”. The participation of Connolly in 1916, which would never have happened had the European proletariat risen earlier against capital, is hailed by the bourgeoisie as the “fitting climax” to Connolly's political career. Once again the dispossessed class is to be robbed of its own experience, the memory of its own class fighters, who are now presented as calculating capitalist politicians on a par with bloody functionaries like Mao or Ho.6 The October Revolution showed that the real way out of barbarism does not involve fighting for nation states which are now so many barriers to the development of the productive forces. And so it remains the historic task of the world proletariat today: the global destruction of capitalism, the abolition of nations. 1Sinn Fein is essentially the political wing of the Irish Republican Army, the Democratic Unionist Party is that of the various Protestant para-militaries like the Ulster Defence Association. 2This was the year that the British Army was sent into Derry and Belfast in response to serious violence between Catholics and Protestants. 3In 1976, Germany was still divided into a Western zone occupied by the American, British, and French armies, and an Eastern zone occupied by the Russian troops of the then USSR. 4 The First World War did not drag all parts of the world into the conflict, so that proletarian elements could be confused about the nature of the war and the period. The possibility of “independent” bourgeois development in the colonies or the concept of the imperialist war was seen as a manifestation of the decadence of the metropolitan capitalist countries rather than of the decadence of global capitalism. Despite the confusions within the Bolshevik Party on this question, this did not at this time lead them to identify with their own national capital. On the contrary, their views on this subject threatened to dismember the Russian Empire. Whereas for Connolly, his position led him into direct alliance with his own bourgeoisie. 5The 1913 Dublin strike and lockout was one of the most important struggles of the working class in the last years before the war. The vast majority of the workers of Dublin were involved, but they suffered a serious defeat in part because of the failure of unions in Britain to offer them sufficient support. 6Mao Zedong and Ho Chi Minh, the leaders of the Stalinist state capitalist regimes in China and Vietnam respectively.